dream giver redux | discography | lostboy! aka jim kerr albums | the return of the lostboy! home > discography > lostboy! aka jim kerr albums > the return of the lostboy! The second Lostboy! album, The Return Of The Lostboy! was first mentioned by Jim during the post-production work on Lostboy! in February 2010. After a particularly fertile writting sesson with Paul Statham, Jim mentioned co-writing two tracks called Song X and A Revolver!. Upon completion of Lostboy! 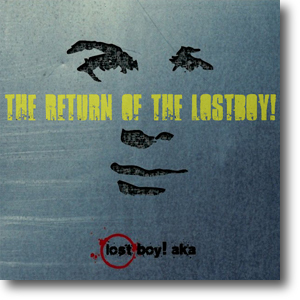 late in February, Jim made tenative plans to start recording The Return Of The Lostboy! initially in October 2010, before tendering for new song ideas from his songwriting team for June 2010. By the end of February, the plans had solidified: a more extensive Lostboy! tour was pencilled in for the last half of 2010, with The Return Of The Lostboy! being recorded in the winter for a spring 2011 release, followed by a six month tour, and then work would start in earnest on Simple Minds' next album. The volcanic eruption of April temporarily stranded Jim in mainland Europe. With the promotion of the first album on hold, Jim worked on new songs, including Sleepless Nights, a song written by Dante and Jools Gizzi (formerly from GUN). Even during the rehearsals for the promotional tour, Jim was mentioning new song titles including Spirit Catcher, Girl Frozen In Time and Broken Glass Park. And as soon as the tour was completed, Jim was in a studio near Oxford Street demoing Summer and Sense Of Discovery. And as Simple Minds' Festival Tour started, Jim was working on new Lostboy! AKA material mentioning a song called Gods Are Everywhere. Bassist Ged Grimes also contributed some ideas, one of which became Wallflower. By September, it had become clear that Broken Glass Park had switched allegiance and was now a Simple Minds track. Jim was now working on Simple Minds by day and tracks for the second Lostboy! AKA album by night. The first track to be officially released was Simon Hayward's Electro remix of the demo Kill Or Cure? which was given away through the official site on the 6th October. By September during a lull between tours, Jim wrote about working with Andy Gillespie on the latest batch of ideas; and mentioned another song called Made From Rock And Rain. Work on the follow-up album was postponed when Jim's mother became ill. When work resumed, it was for Simple Minds with new recording and touring committments. Broken Glass Park and Blood Diamonds were recorded as Simple Minds' tracks and released on Celebrate: The Greatest Hits+ whilst Honest Town and Spirited Away were recorded for Big Music. This left A Revolver!, Animal Life, Believer, Champagne Moon, Everybody Vs Mother Nature, Fireball, Go!, Gods Are Everywhere, Girl Frozen In Time, Heroes Unlimited, Japanese Car, Jasmine Revolution, Jerusalem, Kid Is A Timebomb, King Of The Underworld, Lucifer, Love Is A Four Letter Word, Lay Lady Lay (cover), Made From Rock And Rain, Night Is The New Day, Nostalgia, Sleepness Nights, Sense Of Discovery, Sin So Sweet, Song X, Spirit Catcher, Sponsored By Destruction, Summer, Superstitious, Swim To Me, That Feeling, The Games, The Night (cover), Vicious White Kids, Wear White Tonight, Wallflower and Why Does My Heart Feel So Bad? (cover).